UFTRING CHEVROLET IS ON THE SCENE AS THE 25th ANNIVERSARY CALLAWAY CORVETTE RPO B2K IS UNVEILED IN BOWLING GREEN, KENTUCKY. Uftring Chevrolet in Washington, Illinois has been a Callaway Corvette dealer for several years now, and our General Manager, Joe Knapp, was honored to witness the unveiling of the famous 25th Anniversary Limited Edition RPO B2K Callaway Corvette. These monster cars will be limited in production, with only 25 planned for 2012. Every unit will come in Cyber Gray Metallic with a Carbon Flash roof. These amazing vehicle are a collector's dream, and have been around for 25 years - as they were first designated for the build between 1987 and 1991. The 25th Anniversary is a special occasion and a great opportunity to see what the latest technology can do for these awesome machines. 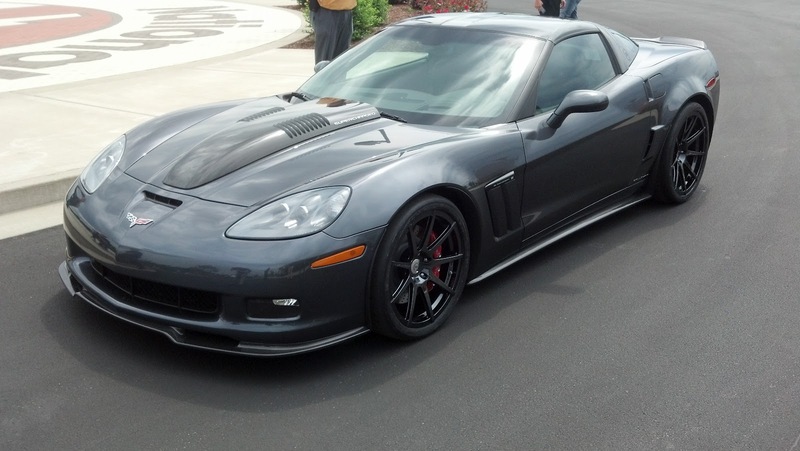 Each edition will feature the Callaway Carbon Fiber Aero package (front splitter, rocker panel extensions and spoiler.) The interior is adorned with ebony leather seats, Callaway steering wheel and much more. Mr. Knapp was at the Dealer Summit IV at the National Corvette Museum in Bowling Green Kentucky on April 23rd. Much more information on our Callaway products can be found at our Callaway Corvette Dealership. Uftring Chevy in Washington Illinois serves customers nationwide, but does regular Corvette business in Illinois, Iowa, Wisconsin, Indiana and Missouri. Gary Uftring is a lifelong Corvette enthusiast, collector and supporter and has been a prominent face for Bloomington Gold and the Mid-Illinois Corvette Club. Recently, Mr. Uftring is a sponsor of the inaugural St. Jude Peoria to Memphis Corvette Drive, departing from Uftring Chevy in Washington.